Hey everyone! Today in honor of the Lou Box Top being a prize in my Instagram birthday giveaway, I’m sharing one of my favorite hacks. If you’ve been following me for a while, you probably know how much I love me a Lou. And this Lou Box Top ruffle hack is one of my favorites! One of the great things about the Lou Box Top is that it’s so versatile, depending on what fabric you make it in. I’ve got them in quilting cotton, silk, flannel, chambray, and knit, and they’re all great in different ways. If you’re doing a ruffle, the substrate can really make a difference. My moon ruffle top is in a quilting cotton, and that is a pretty tight ruffle. This top I’ll use to demonstrate my technique is in a lightweight chambray from JoAnn. That has a great drape, but is lighter than the quilting cotton. My next round? Lous in lightweight tee shirt jersey! Ooh, the comfort. But anyways, back to the matter at hand: the tutorial! All of my Lous are size Small. I don’t add any length, #sewingtall friends! It helps that Beth is one of us (one of us, one of us, one of us…). Keep in mind that this is supposed to be a looser top. If you’re a true size whatever and you don’t want the wide look, consider sizing down. You can see that my moon Lou and this chambray Lou have two different ruffle lengths. For the moon, I used the bottom of the pocket as my ruffle line. I cut out my shirt a half inch below that pocket for both the front and the back to give me a seam allowance. Then I cut out my ruffle strip. Since this was quilting cotton, it was 45″ wide. I cut out two strips at 45″ wide (or just about, minus selvages) and at a length of 13 inches. When finished, that strip is 12″. Beth gives the completed garment length for the straight hem as 23″ in the front and 24″ in the back. Make sure that the length of your strip plus the top of the shirt adds up to at least that, and remember to adjust for seam allowances! My chambray shirt is a little less math, for those like me who hate it! I cut out the top of the shirt at the circles where you usually pin on the bottom pattern piece you’d like. When you do that, you can use the straight hem piece as a guide for your ruffle piece. For this shirt, I cut out two strips at 60″ wide (the width of the fabric) and 8″ long. I sew up the Lou as I normally would, and I save the side seams for last. Instead of sewing a gathered fabric tube onto the shirt, I prefer to gather the strips and sew them onto the hem in two separate pieces. I find that this helps it lay a little neater, as I can make sure there are no gathers in the seam allowances. It doesn’t really matter if you do it either way — that’s just my method! It also makes it a little easier to take out some of the gathers if you’re finding it’s too ruffly for you. Just unpick the second seam, pull some fabric out, snip it off, and resew! See? I promised it was an easy hack! But sometimes it’s nice to just have some measurements and not figure it out for yourself. If you love this look, good news! You can WIN a Lou Box Top in my Instagram Birthday Giveaway! Head back to yesterday’s post to see the other prizes and all the ways to enter. One of those options is to sign up for my bi-monthly newsletter, and there’s another one coming this weekend! Last time I shared my foolproof margarita recipe, so I’d say it’s a preeeeetttttttty good newsletter… And as always, if you make something using my tutorial, I would love to see it! You can tag me in the photo/caption or use the hashtag #maddiemadethis to show me! Happy Instagram Birthday to Me! Where do I sign up for your newsletter? Hi Kathy! Just scroll allllll the way down on any page – it’s at the very bottom of them all! Hey there! 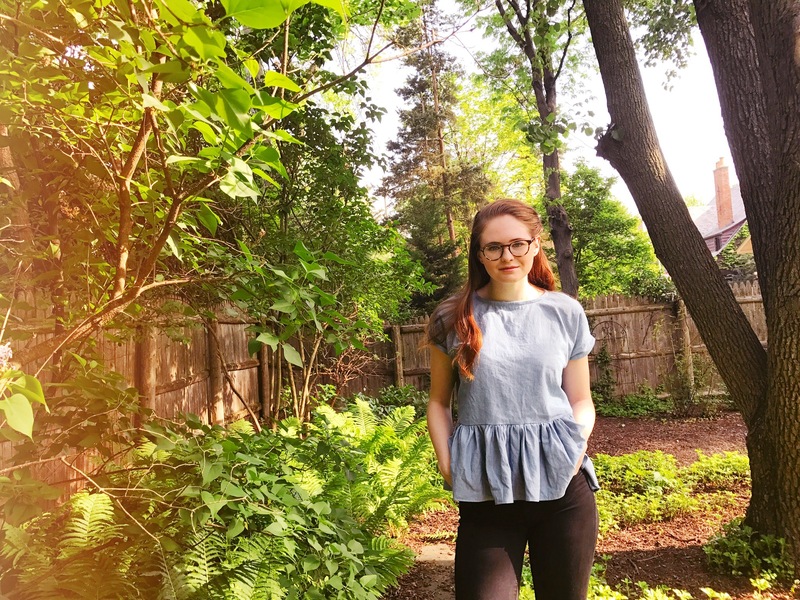 I'm Maddie, a millennial maker on a journey to a more sustainable, handmade wardrobe.